Anyone who has ever purchased a business or personal vehicle has most likely signed a UCC-1 statement as part of the transaction. 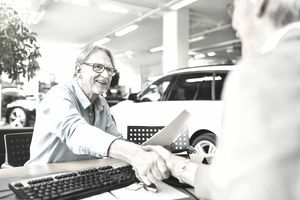 The purchase of a car with a loan from a bank or financing entity is a good example of a Uniform Commercial Code transaction. A UCC-1 is filed and the title is kept by the lender until the loan is paid off. Uniform Commercial Code (UCC) laws are established to regulate sales of and other business transactions. For example, transactions such as borrowing money, leasing equipment or vehicles, setting up contracts, and selling goods are all covered by the Uniform Commercial Code. The sale of services and the purchase of real estate is not a UCC transaction. The UCC laws were set up and are maintained by the , (also known as the Uniform Law Commission), which is a non-profit organization. Each state has adopted its own slightly different but basically the same version of the Uniform Commercial Code. While most states have adopted the nine basic articles and procedures (below), . Article 9: Secured transactions, for personal property, agricultural liens, promissory notes, consignments, and security interests. Most Uniform Commercial Code transactions involve secured property, financed by a bank or lender with the title to the property held by the lender as security until the loan is paid off. For example, when a lender gives a car loan to the person buying the car, a UCC-1 form is filed by the dealer. UCC-1 forms are used for secured transactions (those that have some form of involved). The form includes information about both parties and a description of the property. A is prepared and signed by both parties. The filing creates a against the property, so the borrower may not dispose of the property without paying off the debt. Name and address of the debtor or debtors. Additional information is needed if the debtor is an organization. Name and address of the secured party (person or organization on the other side of the transaction, that holds the security). Information about the involved (the property pledged against the loan or sale). To file a UCC-1 statement, you would need to go to the business division of your state (usually in the Secretary of State office) and search for this form. Many states allow you to file online.